"Professional, reliable, available. Very well operated." "Very professional service from Paul who obviously cares passionately about his business. He took the time to explain to me what he was doing and why and was very willing to share his knowledge. He came out the same day I called and arrived on time, exactly when he said he would be there. I was really impressed and will be referring him to any of my friends who need pest control. " "Roger was on time, knew his stuff, was careful and communicated well. A true expert on white-footed ants! He told us our infestation would need a repeat visit (included in the standard fee)... And it did. I can't fault him!" "My property has a real problem with Argentinian ants. I hired Pestproof in Nov 2015 and they were great. The problem my property had needed repeat visits and I never felt that it was a hassle to call/email Pestproof for another visit. Every call, every email, every visit has been dealt with quickly, professionally and in a friendly way. I can't recommend the company or service enough and just hope my neighbours try it out too." "Always great service from pest proof - it is great to have a service with a 12 month guarantee. There has never been any trouble getting them to come back to retreat any ant troubles we have"
"Prompt friendly service. Fully explained what he was going to do and then let me know what he had found before he left. Gave helpful pointers and instructions to call back if the ants reappeared." "Very prompt, efficient, and informative, explaining the options, what was recommended and why, with a rat situation." "Jake is the man! He tracked down where the rats were getting in and laid bait so that we don't need to worry about them anymore. I highly recommend Jake for his friendly and well-informed service. He also came to the house on a Saturday which meant that I didn't have to miss work." "Prompt and professional service. Jake was very informative and enthusiastic to get the job done to a high standard. I feel confident that I won't be hearing any more rodents in my roof space. Jake has assessed where the rodents are getting in, and has made recommendations to my builder/roofer on how to remedy the access points." "Just had Jake to the property to bait for rats/mice. Jake was friendly, professional and informative. We will definitely use this company again in the future (if we need to). " "We should have called Pestproof weeks ago to deal with a rat who'd moved in, built up some food caches in hidden places and avoided all traps and baits. Very frustrating and unpleasant. When we finally spotted the rat and were able to shut it into a space, we immediately called for help so it didn't get away. Paul came out at short notice on a Saturday, and calmly extracted the rat. Crisis over! We're so grateful for the great service, and we're now using Pestproof's ongoing protection and a… call-out if it's ever necessary. In the past Paul has also dealt very calmly and successfully with a wasp nest in the garden. A pleasure to deal with this company." "Reliable, straightforward, honest. What more can I say?" "Friendly and professional service. Have used this company before and have been very happy both times. Prompt response when called out and great explanation of type of products used and the also catered for our family with pets and children. Would highly recommend to anyone." "Great service and the ants have stayed away! Thank you!" "We find this company excellent to deal with, we have them on a permanent contract to visit our centre regularly, if we ever need an extra call out, they are super prompt and solve the problem very quickly. We highly recommend this company and are very happy with their service. " "wonderful to deal with, jake made it feel like we were part of the buisness, worked in well with us and the boys who did the job were polite ontime and job well done. "I have used another pest control provider fork the past 3 years at our home for rodents but never seemed to get rid of them for good. Pestproof took care of the issue for good and even found the holes they were using to get in. With everything fixed up now we are rodent free. Thanks pestproof "
"Always fantastic service. Professional, thorough and incredibly helpful. Have used 3 times over the years once for ants, then mine and this time for roof rats. Successful every time! " "Paul provides a friendly, fast and VERY knowledgeable service. I can't recommend him highly enough. He came last year and laid baits that are dog-friendly. While he explained that these baits can sometimes be less effective than the more toxic types, we still got a good year of protection. This year, sadly, our dog is no longer with us, so the stronger bait has been laid. Again, at this visit we were impressed with Paul's professionalism and speedy service, not to mention the reasonable… charges. There's no-one we trust more to send those rodents packing!" "Paul was just great, very professional, prompt and knowledgeable about our Rat problem. The inspection and subsequent solution was carried out without any embellishment/up selling (or downplaying), just the facts, So we are now happy that we/ they have solved/solving the problem. Gave excellent advice on the phone and attended to property on a timely basis. "I had a weta problem in my garage of my rental property and Pestproof sorted it quickly and promptly. I'd definitely use them again if I have any pest problems in the future." 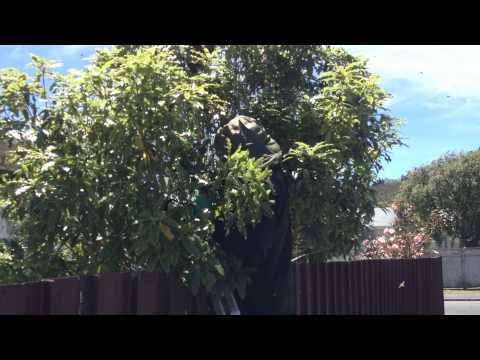 Paul has been extremely helpful in keeping the rats under control on my property which borders the Ngaio Gorge bush. I just have to give a call to get more bait delivered and it's here within a couple of hours. The sort of control system that he recommended has worked really well since 2012. I've been very pleased with the helpful service I've received. "Paul was absolutely wonderful! He is such a great guy to deal with, I absolutely recomend him to others. He was perfectly on time, completely looked after the wasps nest (I'm rather afraid of them) and then gave me all the instructions that we needed to work around it with the bulldozer and earthworks. I was delighted with the service and the no nonsense, easy, practical and sensitive approach. They also offered a 6 month guarantee to come out again free if there are any other wasps… nests in the vicinity to get rid of them. I was very impressed by this! Great company." "Very professional service. We learned a lot about our rat in the roof problem and to date the action taken appears to have been effective. We appreciated the link on the website to the radio NZ interviews." "Paul was exceptionally helpful, explaining what he was doing at each step and why - this meant I have been able to maintain his controls and stay on top of those pests! Thank you so much for your professionalism and effectiveness - would happily recommend to others"
"Pestproof provided excellent advice and product for the job to be done - borer control. They are a reliable and trustworthy service provider." "Great service, super friendly and very committed." "Excellent service. Knowledgable and efficient. Highly recommend." Excellent with communications as well. We had a slater problem....picking up close to 100 a day inside the house as well as swatting them on the outside. Paul came and sprayed and from the following day I have not seen one of the wee critters inside or out.. If any do come back because of eggs they will respray at no extra cost as their service has a 100% guarantee. I have no hesitations in recommending this business. Chris Coleman"
"Paul and the team are friendly, professional and efficient. They have done a great work at very reasonable cost. We were so impressed we now use them for all our residential and commercial properties. Good job guys, keep it up! " "This is the second year that Paul has come to deal with a recurring mice problem I have. I have three dogs so I was worried about potential harm to them, but Paul explanation of the bait being pet safe, out of the way and hard to get to reassured me and I'm glad it did - last year's winter was the least stressful rodent wise since being in this property. He is really easy to communicate with, showed up perfectly on time and remembered what had happened last year - where the bait was etc.… He even offered to have a reminder set up for me next year so that I don't have to remember (or discover the mice...). I highly recommend Paul and Pestproof!" "Wow a very speedy response and it was Good Friday. Paul was actually in Hataitai when I called and he was here within 10 minutes. All done and dusted in no time at all. Many thanks and let's hope that's the last of those wasps. Thank you very much. Regards Dean"
"Very prompt efficient service, came when they said they would and my wasp issue has been swiftly dealt with. Popped an invoice in the letterbox to be paid within 7 days which was great as we could pay online. I have no hesitation in recommending them and will use them again if I need them." "Paul came out to see my property today as I thought I had a wasp problem. He identified the insect as a hover fly however and assured me that they are not harmful to either people, pets or my plants. Thanks Paul, I'm glad I don;t have a wasp problem but if I ever do I'll give you a call!" "I couldn't rate and recommend the company Pestproof any higher! Over the last 2 years they helped us to get our house pest proof and to keep the populations on the property under control. Paul's work and advise has been every time extremly valuable, prompt and efficient. Every member of his company arrived on time, was pleasant to work with and provided excellent results. We especially like that this company takes the entire environment into account for finding the best effective but least… harmfull solution to the current problem. The specific service for rat and mice treatment, of returning within 6 month without any addiitional costs, has proofen invaluable to us. This company really stands by its word and helps you to solve your issues with any unwanted pest and sets you up for self control along the way. Both thumbs up from me. And I am happy to give a personal reference to any new customer at any time." "These guys changed our lives! the ants disappeared, its been 13 months and they guaranteed it for 12 and they still haven't come back. I was super impressed that when we did call them back to re-spray they spent some time walking around the house, looking for ant trails and, as none were found, advised against a re-spray advising it would've been a waste of money - brilliant service, free consultation and they didn't try and sell us something we didn't need. Would happily recommend these guys… as they know there stuff." "“We found Paul and his business to be prompt, professional and very effective when we have had dealings with him. We would, without hesitation, recommend Paul and the team to anyone.”"
"Excellent job Nd have herd great comments from others to"
"Awesome service! Got the job done quick and for a reasonable price"
"We only signed up with Pestproof Pest Control in July but I have to say I was so impressed with the prompt efficient and professional service we have received to date. Paul was very helpful and obliging from our first conversation and Jake is an absolute star! Jake came to our site to assess our requirements and really went the extra mile, not only ensuring we were equipped with all the necessary pest control but explaining how it worked, best options for our site and what their procedure… included going forward. Both Paul and Jake have followed up to ensure we are happy and everything is working fine which is a refreshing change from having to chase people up as is so often the case with providers. I highly recommend Pestproof Pest Control based on the experience we have had with them to date." "Great, no-nonsense service, Paul was committed to solving our mouse infestation quickly and permanently with expert knowledge and advice. We have an indoors-only cat who is a beloved member of the family so Paul was careful to consider pet safety as part of the extermination plan. Highly recommended! " "Paul did all he said he would do: he come when agreed, made recommendations to prevent the rats getting back into the roof, got rid of the rats, and offered to put protection around the bottom of the palm tree near the house to prevent them getting back into the ceiling (until I could arrange to have the tree removed). For all of that I am extremely grateful. Where Paul differs from many other people is that he is extremely customer focused, he listened to my concern and went way beyond what… was expected by coming back the following week to check on things. Thank you so very much Paul"
"I have used Pestproof Pest Control on several occasions and would highly recommend them. If you want a professional, efficient team to carry out your pest control - then look no further "
"Paul and his staff have always done their job efficiently and professionally and in a timely fashion. They have taken time to explain why they are doing what they are doing and what else may be required (or not). A pleasure to work with and very discrete in a busy café." "PestProof Pest Control are not only experts in pest control , they are great to deal with. With an honest no nonsense approach, Paul Chapman and his team get the job done. I would recommend PestProof anytime. " "Excellent service. I appreciated the transparency re pricing and quick efficient service. Effectively got rid of wasps and rats. He also patiently answered all my questions about the products used." "I've relied on PestProof several times at this point, for rat and ant problems at my house. Paul was efficient, helpful, and professional in each interaction. Nic was the primary person performing the actual work, and has been equally helpful and thorough, taking time to root around the property to assess the situation and recommend a plan of action. The initial infestations were large enough to warrant some follow up visits to reapply barrier defenses (ants) and bait (rats), so having the… long call back period included in the service was fantastic." "We were very happy with the service we received from Pestproof. The problem we had was resolved quite quickly afterwards, and we found that they explained their reasons for doing things really clearly and we loved the fact that we had 9 months free call-back if the problem re-surfaced (which it didn't)." "Excellent service and results. They stand by their work and are very professional at exterminating rats. Don't waste your money buying the useless rat poison and traps from the supermarket, just ring these guys." "I am very happy with the service provided by Pestproof; after I’d seen a rat on the property, their representative came the same day, checked for rats, and put poison in the roof space, under the house and outside where there was evidence of a rat’s nest. He also checked vegetation around the house and gave advice. Living close to the bush, this is the second year I’ve needed Pestproof’s services and I find their representatives very courteous, prompt in their service, and adamant to… get on top of any pest problem." "I would highly recommend Paul and Pest Control. Professional throughout. Came at very short notice and was very helpful in advising how to fix the pest problem long term. " "Paul was very professional throughout. My wife called him to make enquiries about our wasp and mice problem, and made an appointment for the day after. He was prompt in arriving, thoroughly explained to me what he was going to do about our pests, and was done in no time at all. I would recommend him to others." 3) useful knowledge in terms of borer, their life span,… their living condition and how to deal with the wood which get cosmetically damaged. Overall, I felt much safe for the house after the treatment..
"Two years ago I had these guys around to solve a flea problem, it cleared right up and despite the 1 year guarantee I never had to call them back. So today in my new flat when I spotted a mouse I knew just who to contact. Within 30minutes of my email early in the morning, Paul had replied and texted me a potential appointment time. Nic was punctual and well prepared. He talked me through what he was doing and how to keep an eye out for any trouble in future. With a 6 month guarantee I am… feeling a lot better off for getting in touch with the team at Pestproof." "I can't say enough about Paul and Nick. Professional, prompt, explained what they were doing and why, and most important - they listened to us and solved the problem. They got the job done, efficiently and professionally - and were really nice to chat with to boot. I will only ever use them in the future. Many thanks!" "I chose Pestproof to tackle our garden wasp nest because of the positive comments on this site, and it was a great decision. Professional, great communication, quick and tidy job - left me feeling good about the whole experience. And all the treatment details shown on the invoice for later reference." "I’ve used Pestproof on 2 separate occasions and have been impressed with services provided (initially for rats and secondly for ants). Unfortunately the ant problem recurred after 8 months whereupon Paul has done subsequent follow-up treatment (which I hope will be successful). Without prompting he extended his “free call-back period” by many months. On each visit, Paul has provided clear explanations of the problem faced (e.g. type of pest and their habits) and his proposed remedy… (e.g. type of treatment and inherent low risks). \'Value for money\' has become clearly demonstrated by his reliable “putting it right” approach." "Highly recommend Paul for everyone\'s pest control queries....fast communication and service A"
"Paul and his team are fantastic to work with"
"Fantastic, super fast, service, wasps were dealt quickly.Paul clearly knows his wasps/bees and is a very friendly and pleasant person to deal with." "excellent service ..honest person too thanks"
"Fantastic service. I have used Paul from Pestproof for the last 7 years at various properties and not only is Paul a very nice person to deal with he also carries out his work in an extremelly professional maner and gets the job done. I will be continue to use Pestproof should the need arise in the future. Thanks again Paul "
"Very prompt email replies.Paul was very organised and efficient.Thank you!" "We have used Paul\'s services as required over the past 6 to 7 years. He is always courteous, punctual, efficient, and he listens to what you have to say. We definitely recommend him for pestproofing." "Pest Proof consistently provides superior service and they are clear and efficient in all their dealings. I highly rate them. From : S Mulholland of Lloyd Richardson Ltd Property Managers"
"Pest Proof delivered a very prompt , efficient and economical service. The treatmnet for ant infestation is working, as II have not seen any ant trails since the Pest Proof visited two weeks ago. I have also observed many dead ants both inside my house and outside the house where they were once very visable." "Pleasure to deal with and will recommend to friends & family." "Great service! Would use again as very informative, attention to detail (like putting overshoes on when entering the house). Nick was very friendly and professional. I like their back up plan if not resolved although I don\'t hear any extra visitors running around in my ceiling so may not need them." "Sorted - so quick and relatively easy - thanks Paul, great job. Will contact you in the future if i have more pest problems. Thanks again." "I used Paul to get rid of wasp nests in 2 of my properties in the same week. A very quick response both times and a job well done." "Rang Paul at 9am and the job was done by 10.30. No more wasps. Great job would recommend to all who have any pest problems." "Excellent service. Very professional. Easy to deal with. Best Value." "Highly recommended, Paul was totally professional and friendly. I will use them again in the future if the need arises. thanks for the quick response Paul." "Fantastic service, and even better value. Highly recommended." "Paul\'s customer service skills were the best I have experienced in a long time. Very professional, on time and most importantly got the job done!" "We had a bit of an unusual scenario, in that we had a rodent problem in our car! Paul was very professional and thorough, and very obliging in returning a number of times to ensure they were truly gone! Thank you Paul! " "We had a rodent problem in our ceiling. Paul was very knowledgeable about rodents, the bait he used, ways we could eliminate the possibility of the rodents returning, how they got in, how we could stop this permanently etc.. He was also extremely patient as have 2 small children and a dog that needed controlling while he was trying to view the roof space,and around the outside of the house and the roof. He came when he said he would and had excellent communication. Would highly recommend AA"
"With Paul\'s advice and assistance we got rid of our rodent issue. A great relief. We are completely satisfied and highly recommend this service." "Paul was incredibly helpful and thorough in getting rid of our pest problem. He came the same day i called which was great! I felt he really went the extra mile, boarding up areas to stop them coming in and had some great advice on things we can do further! Overall an excellent service and i would recommend him to anyone!" "I run a busy cafe and it is reassuring to know that I have an ongoing pest control programme in place. Paul is a pleasure to deal with and I am happy to recommend him for anyone that needs a reliable expert to control pests." "I called in Paul from Pestproof Pest Control to deal with some unwelcome rodents who had taken up residence in my attic. Paul was excellent and dealt with the matter very professionally. He also gave advice on measures to prevent any further invasions which I followed and two years on have had a rodent free attic. Pauls expertise is joined by his polite and friendly manner and I would unhesitatingly recommend him- and have done." "Paul is a very pleasant person to deal with and very reliable - highly recommended"
"The job was done within less than two hours of my initial call. Very impressed." "Great service. Prompt and reliable. " "Paul had to come back a couple of times but he was very professional and friendly. Had no trouble lifting heavy stuff which was very useful. Gave good advice about how to stop problem again. Great guarantee too. " "Did fantastic job, came within the hour and charged very little, considering it was a weekend emergency call. Unlike most pest people who just kill all the honey bees, he took as many away as possible to a beekeeper so they could continue to di waht nature intended for them." "Paul was very helpful and I appreciated his honesty. He was also very good in keeping in touch regarding the problem." "I rang paul at about 8am. I had painters at my house wanting to get on with a job and they couldn\'t because one was allergic to wasps and we had a big nest. Paul came around in 45 minutes of me calling him. He was an absolute pleasure and one month on there have been no return. I highly recommend Paul to take care of your problems. "So pleased we decided to call Paul to deal with a wasp nest in our garden shed. Also great to know that if we ever have any pest problems in the future we know who to call." "Paul did an excellent job - sending me photos to show other hazards (wasp nest) and areas open to pests making it easy to fix them. Highly recommend Paul." "Paul is a good honest bloke. I refer him to friends & family regularly and I have only heard positive feedback from others. Paul\'s done a great job last time he was in and we haven\'t needed his service for a while. " "Found Paul to be extemely helpful & efficent Thank you for the service"
"Paul - thank you for your prompt & efficient attendance to our wasp issue." The owner and operator, Paul Chapman has 34 years of experience in Pest Control and is registered with the Pest Management Association of New Zealand. For prices please refer to our website below.